Bob’s ex-wife (played by the lovely Marilyn Maxwell) – who’s still interested in him. Rip Torn (Dion Kapakos) as the producer of the play who’s trying to steal Lucy away. ﻿ Critic’s Choice is a romantic comedy, with most of the comedy being verbal. The only real slapstick comedy in the film is with Bob Hope’s recurring back problem. He throws his back out whenever he bends over at an inopportune time. Also, towards the end of the movie Bob Hope’s character become drunk on the opening night of Lucy’s play. There are fine performances by Marilyn Maxwell, Jim Backus, and a very minor appearance by Richard Deacon. Jim Backus’ character is both Hope’s neighbor and a psychiatrist. He helps Bob Hope initially with his bad back, and later on “on the couch”. Critic’s Choice deals with the subject of marriage, remarriage, merged families, self-respect and what is truly important in your life. It’s done in an entertaining manner, and I recommend it strongly for fans of Bob Hope and/or Lucille Ball. 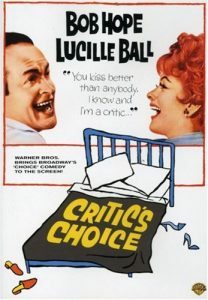 With a light touch of New York sophistication, Critic’s Choice is a smartly grown-up vehicle for Bob Hope and Lucille Ball, making their fourth appearance as an on-screen duo. Adapted from the Broadway play by Ira Levin, it’s a fitting follow-up to the pair’s previous comedy (1960’s The Facts of Life), with its upscale story about top-ranking theater critic Parker Ballantine (Hope) and the trouble he gets into when his second wife Angela (Ball) decides to write a play. Given Parker’s snobbishly influential reputation for writing scathingly negative reviews, it’s only a matter of time before he’s forced to confront the issue of reviewing “Sisters Three,” the comedy that Angela has written, rewritten and polished with the help (and romantic advances) of Dion Kapakos (Rip Torn), one of Broadway’s hottest young playwrights. Complicating matters even further is Parker’s touch-and-go friendship with his ex-wife (Marilyn Maxwell) and the disapproval of his young, intelligent son John (Ricky Kelman), who serves as his father’s much-needed voice of conscience. Add it all up and Critic’s Choice is an easygoing comedy that occasionally falls flat (veteran TV director Don Weis can’t decide if he’s directing an all-out comedy or a marital melodrama), but Bob & Lucy make it surprisingly enjoyable, and Levin’s source material has a lot to say about marriage, divorce, and the foibles of playwrights and critics in the high-pressure world of New York theater.